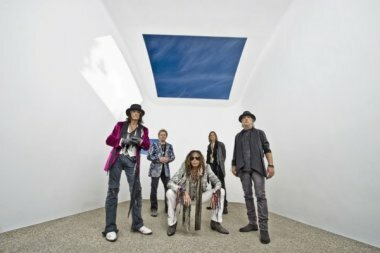 Aerosmith have continually reinvented themselves throughout their 42-year career. The band's new album, "Music From Another Dimension," is now out. Tom Hamilton recently stopped by to talk "Music." "Music From Another Dimension" feels like an album for anybody that has ever been an Aerosmith fan. When you were writing and planning the album did you have a sound or vision in mind? In my mind I was just doing what comes naturally to me, what I like to listen to. I think that coincided with what the band wanted to do. We never sat down and said, 'Let's contrive an album that sounds like 'Rocks' or does this or does that.' We wanted to do something that had a connection to our early days for sure, but most of what goes on with any Aerosmith album is based on how the song comes out. The album is sort of a summary or everything that we've learned and tried over these years. You can hear the seventies era, you can hear the Geffen 'Permanent Vacation' 'Pump' era. It's cool, it makes sense. You brought Jack Douglas back to produce the album. How has your working relationship evolved from back in the seventies until now? It was beautiful. It was very much the same sort of vibe, which was Jack setting a very demanding work schedule and work pace, but at the same time bringing a lot of humor and exploration into the vibe. Jack is beloved by everyone in the band because he encourages everyone's ideas and he encourages a situation where everybody's personality is respected and paid attention to and everybody likes him for that. It's a great thing for the band; it creates an atmosphere where more ideas come out and more interesting ideas come out. One thing that has always set Aerosmith apart from the other classic rock bands was that your "new" music always remained relevant to the newest generation of fans. It's been awhile since we've gotten a new album of original music. Did chart position and the albums' potential success weigh on you guys at all during the writing and recording process? Some people get caught up in what we've done before and how are we going to do it again. The way to deal with that is just to go song by song and just go for the song. Whatever you're working on makes it into the best song that it can be. Don't get too caught up in some of those larger issues. Just make sure that you write the best verses and choruses and bridges you can then fate will decide what happens to it. You've seen the music industry change several times in your 42-year career. It's changed drastically since "Just Push Play" came out. Fiscally speaking there probably was no need to make a new album, but it seems like the new album really rejuvenated the band. Was going through the creative process something that the band needed? Yeah, I think so. We needed to challenge ourselves with that. We were at a point in our career where we could have just gone out for three months every year until eternity just playing 'Walk This Way' and 'I Don't Wanna Miss a Thing' and all the Aerosmith favorites. I think we all got a little bit hungry to show that we're still a real band and we're functioning on all levels. We didn't want to be one of those bands that let themselves get fat and think about beer all day. We wanted to be out there in the fray and be part of it. At any given time we could point to what we've been working on.